If you are from the US and want to see volcanic activity (ancient or present), glaciers, geothermal lands and geysers, mountains AND ocean, you’d have to hit up about 4 states (minimum) that are all vastly spread apart and spend weeks, if not longer getting to and then exploring each and every destination. 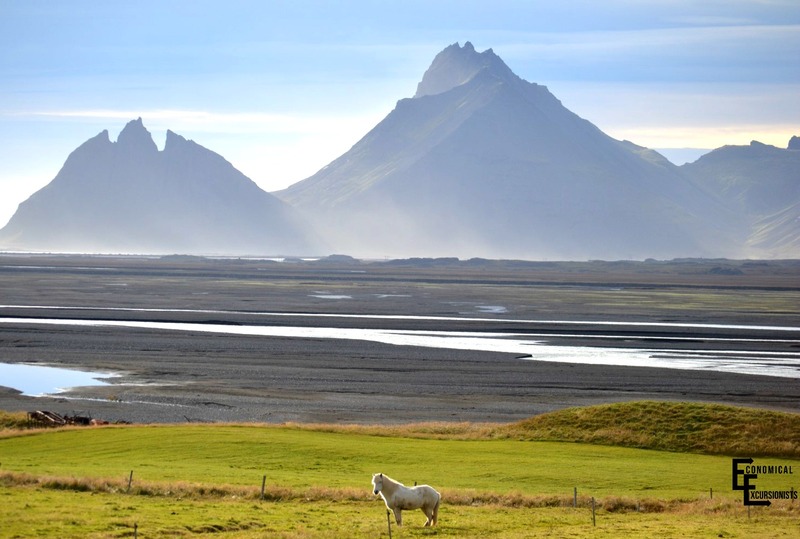 Or, you can just go to Iceland; the land of fire and ice! In just a matter of days you can hit basically every geological wonder the world has to offer and be absolutely mesmerized with the power and beauty of nature at it’s finest that is in this world of ours. In fact, in some of the spots, you’ll be wondering if you are even still ON Earth! There is so much to do in Iceland, and truly, no amount of time is probably enough to spend exploring the beautiful country. 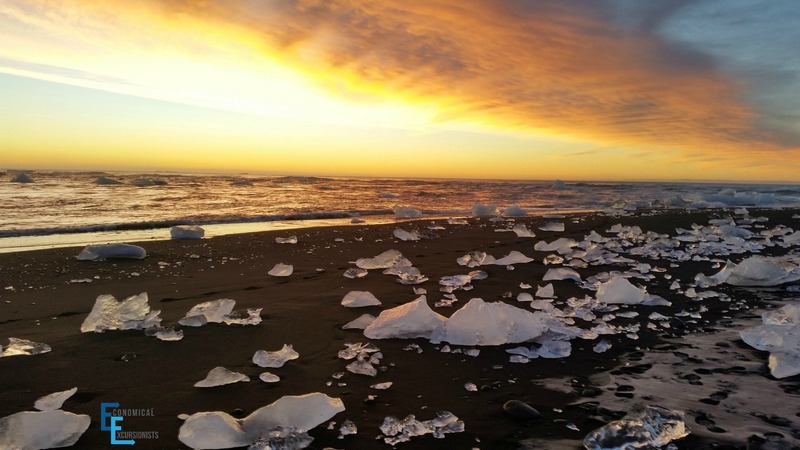 However, even with just a few days, you can get a taste of why Iceland is becoming one of the top tourist destinations in the world right now. I’ve broken down our trip into several sections to show what you can do with a variation of days. 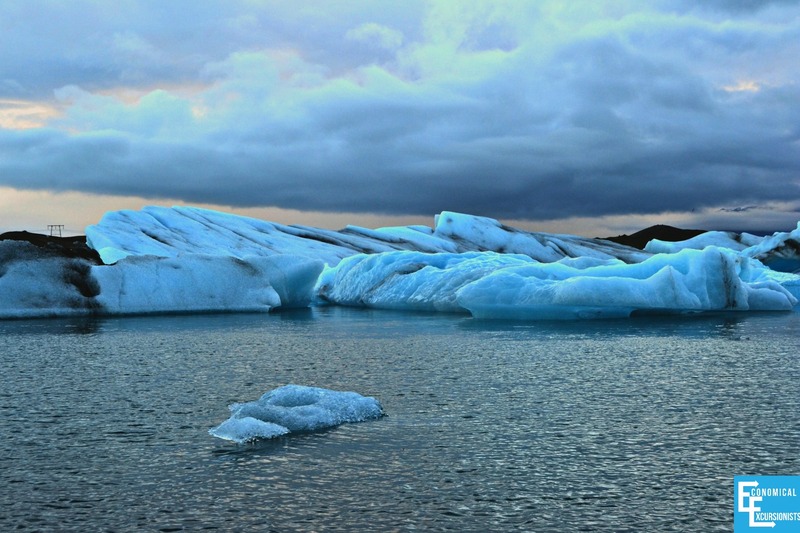 *** Iceland’s tourist industry is absolutely exploding. So much so, that they sometimes struggle w/ enough hotels to house all the people flooding in!!! This is fantastic for Iceland’s economy but can be devastating to the beautiful nature that the tourists are coming to see. While most of the sites we visisted were free, I can easily see many places started to charge to help with upkeep and minimize the damage of high traffic in the future. Also, even from reviews and sites that I used as research, it is clear how quickly Iceland is adapting to the influx of tourists. Roads that travelers used to say were gravel are now paved, waterfalls that you could practically walk up and into are now being roped off, etc. I would not be surprised if this all continued as more and more people come to Iceland. Currently, you can camp anywhere that is not private property or blatantly states that camping is not allowed. Again, it will be interesting to see if this changes over time. If you are choosing the camping route, help future travelers enjoy the flexibility and fun of camping by leaving no footprint behind and being considerate to your natural surroundings. The entire trip, we took our time. You can easily cram more into each day if you have less time or spend even longer at sites, depending on your time table. We went at a leisurely pace, started around 8am most days and wrapped up around 5pm most evenings. We chose to use a Campervan (read more about our GoCampers experience here!) therefore we had no required times we had to make it to certain destinations and giving us tons of flexibility. I have included GPS coordinates for all sites. When we had coordinates, it made finding locations an absolute cinch! Finding destinations based on just typing in names was often difficult due to different spellings of Icelandic words. We downloaded an offline map prior to leaving (google maps or the Map.ME App) on our tablet and dropped pins in each location as well. This was great for knowing how far each location was from each other, helping us to not only plan our time, but also not get lost! 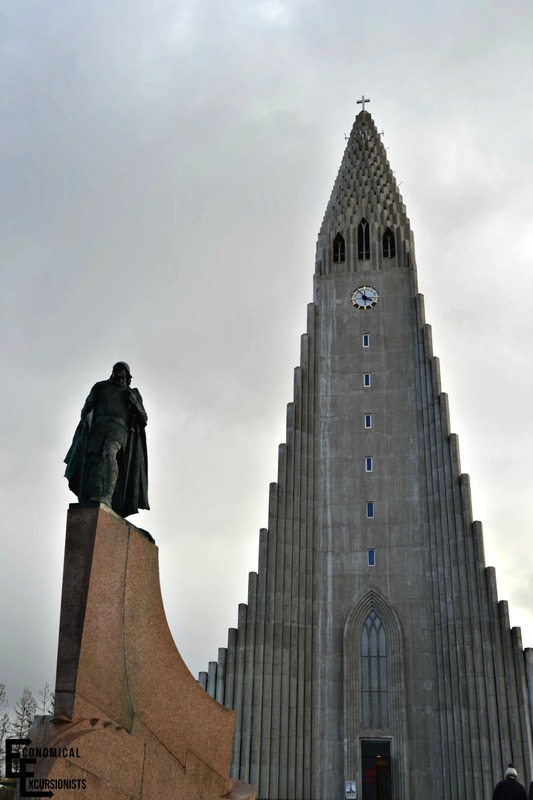 You will most likely be flying in and out of Reykjavik. However, this is actually a white lie, because the airport is in the nearby town, and therefore properly named, Keflavik. It takes a good 45+ minutes to make your way from the airport into the capital city. However, no matter what time you land, there are 24 hour shuttle services with FlyerBus (LINK), through Reykjavik Excursions. 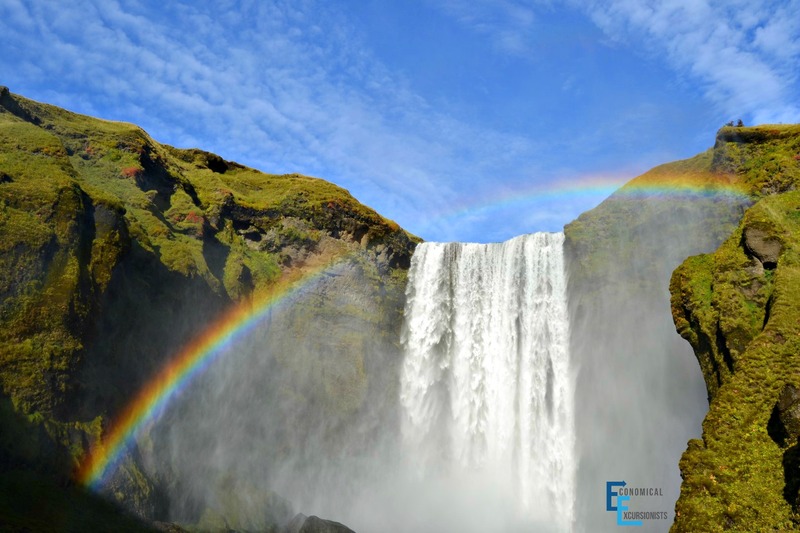 You can easily book online ahead of time and can choose to either take you to the Reykjavik Excrusions headquarters and then find your way via taxi or public city bus to your hotel or pay a few extra dollars per person and they will transfer you to your hotel. Somehow, Flyerbus kind of has a monopoly on getting out to the airport (outside of an expensive taxi option), as there is no public transportation that goes out and most hotels do not offer shuttle service. If you are short on time, I suggest skipping Reykjavik all together and getting out of town as soon as possible. There is so much to do in Iceland and the city itself doesn’t hold THAT much history or interest in comparison to the beauty of the Golden Circle or Ring Road. If you have flexibility though, you can alot for about one full day in Reykjavik and still hit most of the major sites. If staying downtown, almost everything is walkable. If not, they have a great bus system that you can use to get around as well. If you’ve read any of my other city itineraries and suggestions, you know that I am obsessed with Free City Walking Tours! First, they are, well, FREE, which as the ECONOMICAL Excursionist, I am ALL about! Second, they are always a great overview of the city you are in, giving you great background info to make everything you see come into better focus. 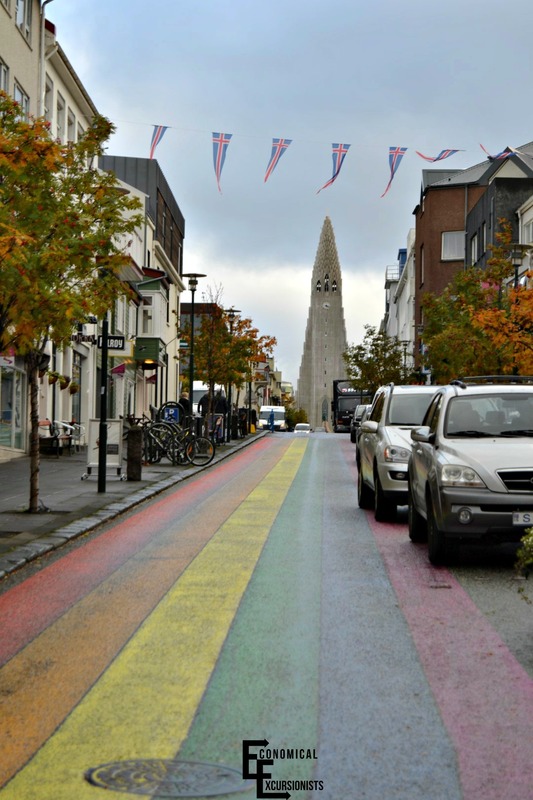 Reykjavik’s Free Walking Tour was about two hours and was a great way to see Downtown. There are a lot of museums within Reykjavik, most addressing the history of Iceland, the Vikings or the way of life for original settlers. Unfortunately, like so many other things in Scandinavian countries, they were all expensive (over $20 per person!). However, if you have the time or money, I’m sure they would be a great insight into the country’s past. Just check out TripAdvisor for a quick list of the different options available. 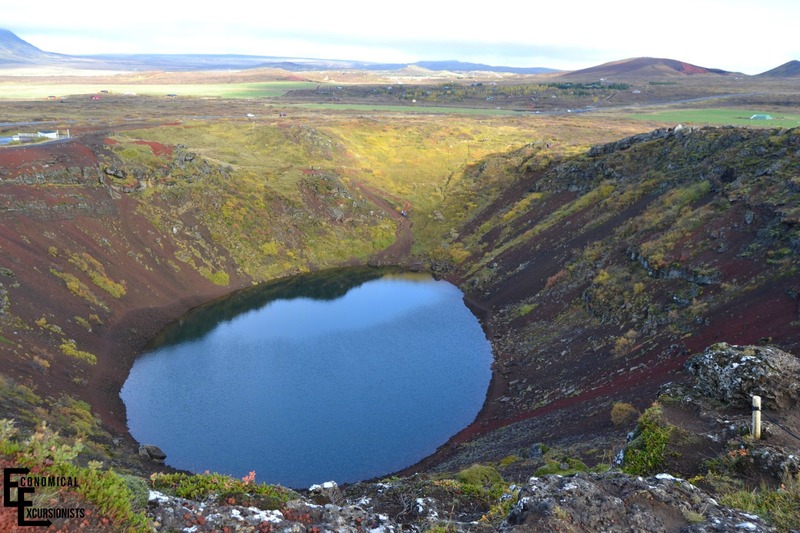 This beautiful cratered lake was a great intro into the volcanic history of Iceland. This was the only site that we actually had to pay to go to, but was still amazing to see first hand. You can walk the entire rim as well as take a path straight down to the lake. 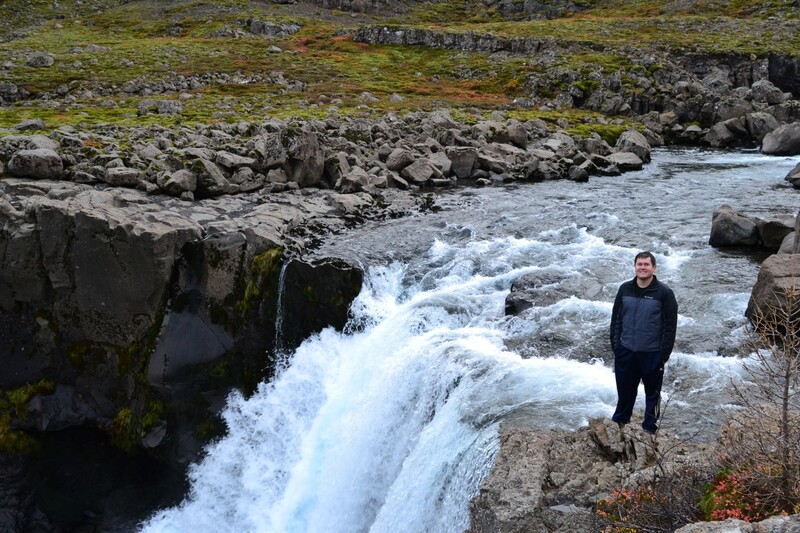 If you haven’t done the Golden Circle yet, get ready to get your fill of waterfalls in Iceland. While yes, you will be on waterfall overload, each one was so drastically different and beautiful than the last. Take advantage of your location and time in Iceland and just see them all!!! Only about 20 minutes away from the crater is this stunning waterfall. Granted, the weather was great while we were there, but it has to be one of my favorites of all the waterfalls we saw. Get your raincoat on even on nice days because you can take a path behind the waterfall and get an absolutely different viewpoint of the falls! At least if you are camper-vanning it up, like we were, you’ll be ready for a shower anyway! Walk right behind the raging falls! 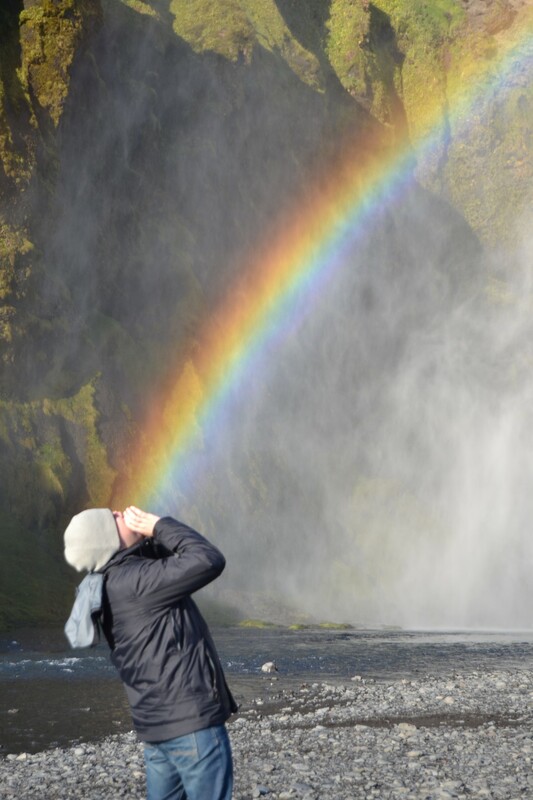 Skógafoss was another favorite because of the rainbows!!! If you can make it to this waterfall when there is good lighting, it is absolutely stunning! Once again, you can walk right up to the waterfall and if you are lucky enough to see the rainbows, look for a pot of gold! Ok, so there are no leprechauns in Iceland, only elves! Take the walk up the steep steps to get an aerial view of the falls and continue to walk along the river for more great sites. Time Needed: This will vary depending on what you decide to do. To walk up to the falls, climb the stairs and walk a little ways along the river, it took us about 45 minutes, but if you want to hike further, plan for more time. You don’t need skittles to taste the rainbow! Why was that a bad idea? 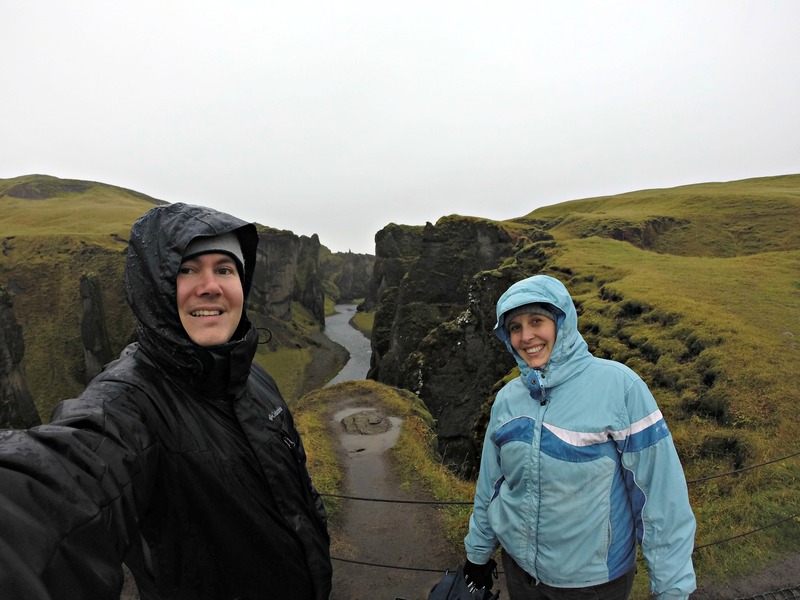 Well, we quickly learned that weather in Iceland is unpredictable and the perfect weather and lighting that we had our first day was soon to vanish into dark, dreary and rainy clouds! As mentioned above, we decided to start our day in Dyrhólaey. Despite the wind and rain, we peered out over the rock ledges in search for puffins that supposedly frequent the location. Apparently though, the puffins are only around in the spring and summer months, so our search was in vain! However, it is still a great spot to get amazing views of the rock arches, beautiful sea side cliffs and surrounding areas. 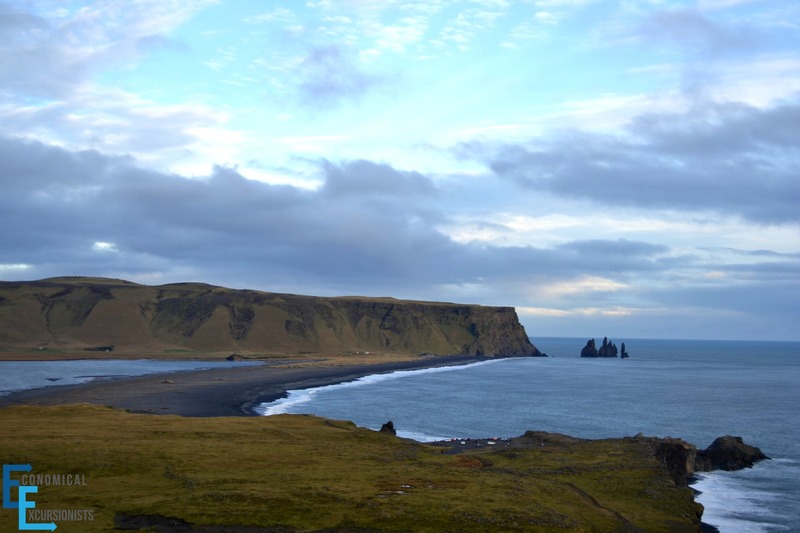 Only a few minutes away from Dyrhólaey is Reynisjfara, an amazingly beautiful black pebble/ sand beach. 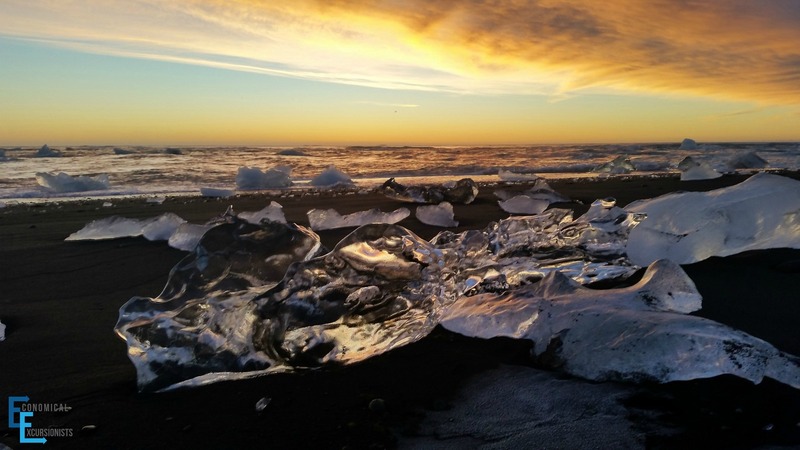 Iceland’s volcanic past is especially evident when walking along the black sandy beaches, a completely different experience from the tropical, golden sand many of us are used to. 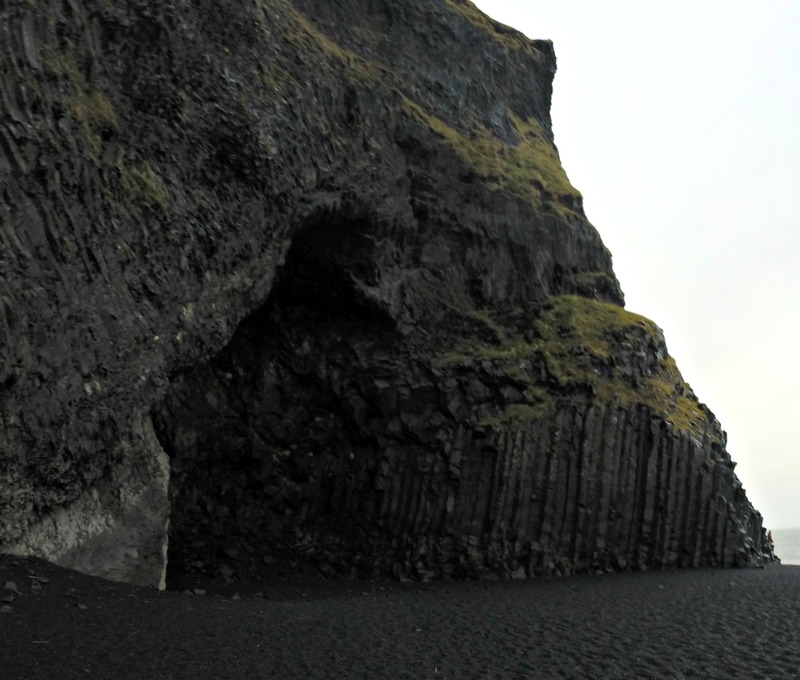 As you walk along the beach, you’ll see amazing basalt columns and out at sea, you’ll gaze upon three basalt sea stacks. Many people choose the town of Vík as an overnight stop. Had we gotten out earlier on our first day, we could have squeezed everything in mentioned so far into one day, making Vík a very easy overnight’s stay. Since we weren’t spending the night, we had no better reason to stop in town other than to fill up on gas and coffee. 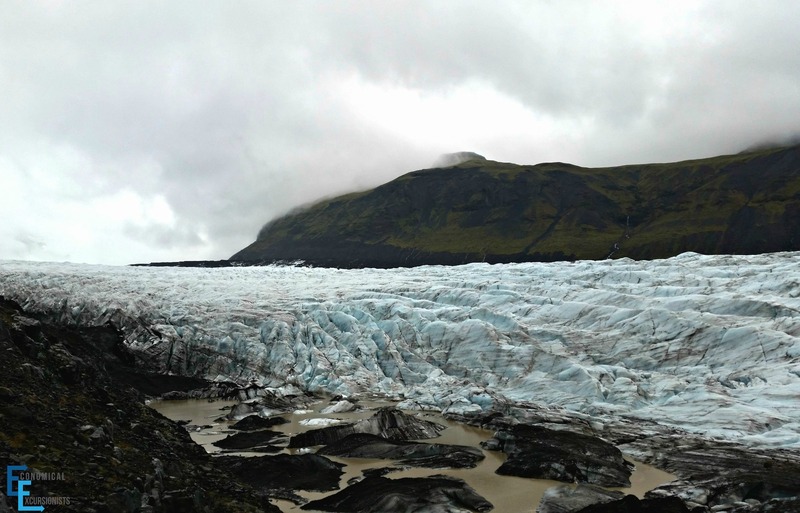 Note: Today’s area is a great location if you are wanting to hike ON a glacier. We had recently done this while in New Zealand, but if you have never had the opportunity, walking on the ice, into ice caverns and peering into deep crevasses is simply amazing! This strange lava ridge surrounded by stone cairnes is just a quick stop along the road. Remember that small pebble you pocketed while at the black beach? 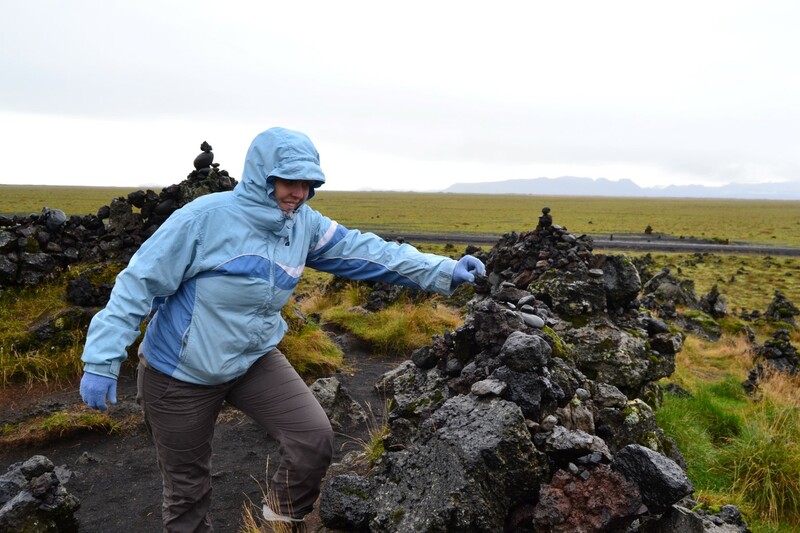 Legend has it that it is good luck for travelers to set a stone on the cairns as they pass by! This absolutely stunning canyon is just a short jaunt off the ring road. You can easily see the power of erosion as the river cuts through the cliffs. This is another location that you can easily decide how long you want to stay at. There is a nice hike along the cliffs that lead to a tourist information office about an hour or so away, but due to wind and rain, we only opted for the first few viewpoints. Time Needed: 30-45 minutes if just going to the first viewpoints, but about 2 hours if wanting to do the full, round-trip hike. Blustery winds and rain won’t stop up from sight-seeing!!! This is the one spot that I totally forgot to take good notes on location for! However, the nice thing is that while driving, there are signs everywhere telling you where major attractions are. 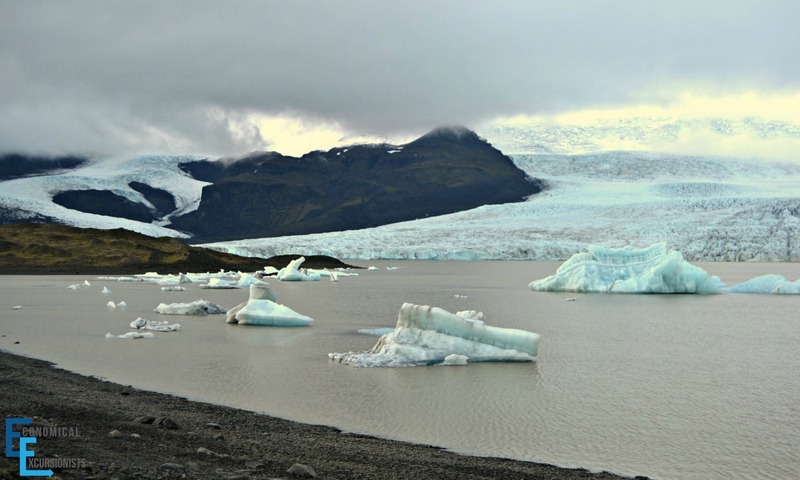 Shortly before the Fjallsárlón lagoon, you’ll see signs pointing simply to “Glacier.” As you drive, you’ll see the absolute enormous glacier, so when you start seeing the creeping white, just start looking for the attraction sign. No resources we were using recommended this stop, but I have no idea why! It was awesome! You can walk almost directly up to the glacier!!! You can see the deep, steep crevasses as well as the broken off giant pieces of glacier floating in the melting lake. 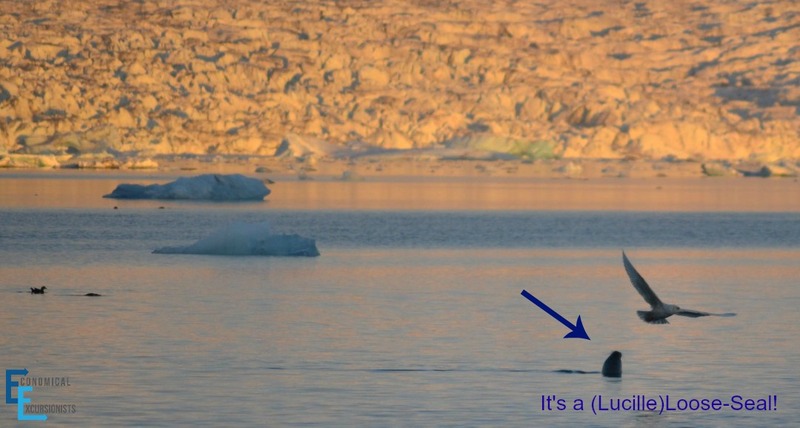 It is a great preview into the lagoons and glacier sightings you’ll encounter shortly! 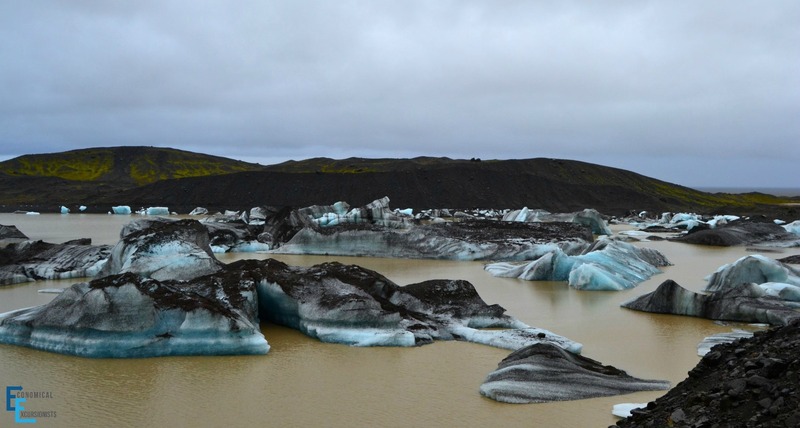 Most people skip this lagoon and head straight for the popular nearby Jökulsárlón lake, which is a shame. While Fjallsárlón may not be AS stunning, that doesn’t mean it still isn’t breathtaking. Plus, there was nobody else there because they were all at Jökulsárlón! 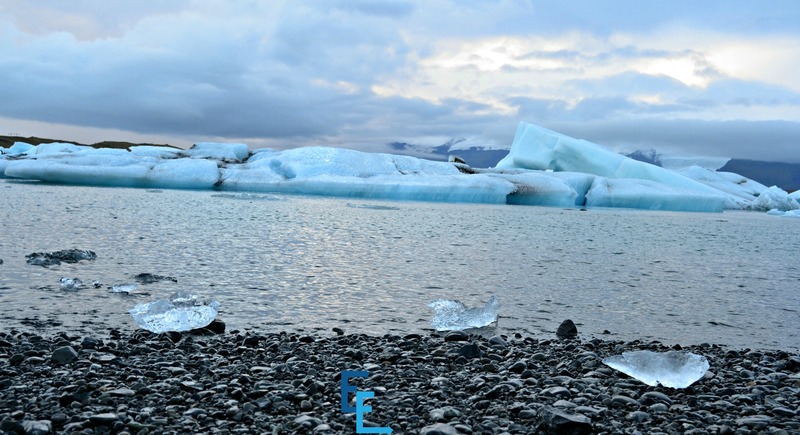 You just can’t beat the solitude when hoardes of tourists are ready with their cameras at Jökulsárlón! One of our favorite sites in all of Iceland was this stunning lagoon filled with blue glacial pieces floating out to sea. We got there at dusk, making our photos turn out very dark as well as full of other people. With night setting in, we just parked our car in a pull-off area and got ready for a night of Northern Lights watching! Any Arrested Development fans out there?? Time Needed: 30+ minutes (more if you are a photo-holic, like me! You really could spend all day here! )+ another 15-20 minutes across the street on the beach of the ocean. One of the best decisions we made of our whole trip was to spend the night at the Jökulsárlón Lake so that we could rise with the sun and hopefully before most of the tourists. If you have this opportunity, it is a must! If not, if you can try to book it to the lagoon first thing in the morning. You will NOT be disappointed!!! Take the time to cross the street and head over to the ocean as well. 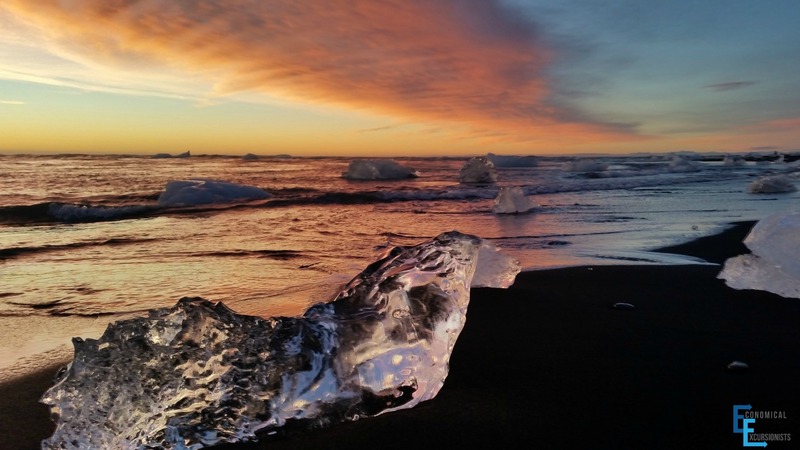 Walking along the black beaches with the contrasting glass-like ice is other-wordly. Not to mention the crashes of the waves on the glacial pieces is simply breathtaking! 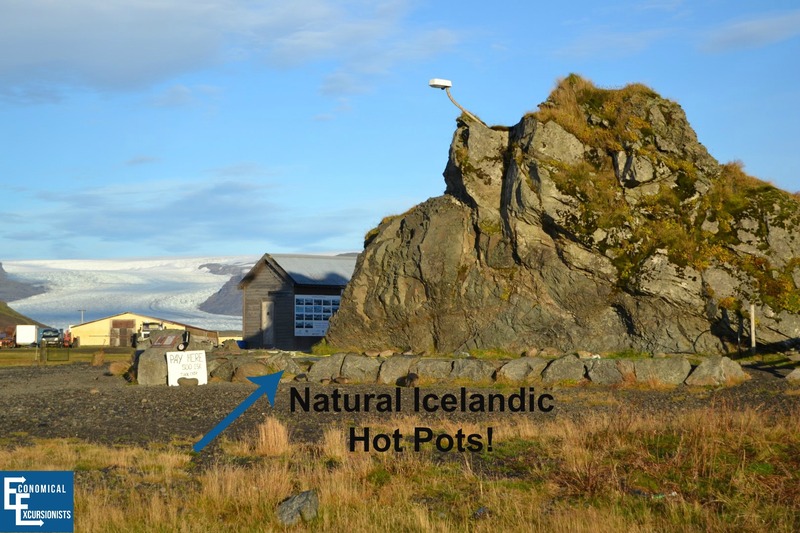 Natural hot pots are all over the place in Iceland and you are surely bound to find plenty as you drive along the Ring Road. One is the Hoffell Hot Pot, which has several small jacuzzi-like tubs set below the beautiful mountains among free-roaming Icelandic horses! Full disclosure, we didn’t actually get in (4.5 months pregnant, I was weary not knowing the actual temperatures and cleanliness of the waters) but what a perfect way to soak your road, weary bones!!! Nobody else was there and it could have been a simply magical break from a full day of driving! Time Needed: However much you want to relax in the warm, soothing waters! Many people use this town to stay in overnight. We simply used it as a good stop for necessities. We refilled on gas and stopped for groceries and then continued on our way. At this point, crank up your tunes, as you’ll be starting quite a long drive. Our campervan actually had a blue-tooth connection, but we had also brought along an auxillery 3.5” headphone jack to plug into our tablets and Mp3 players, which were loaded up with our favorite bands for the long stretches of driving in this area. Sit back, enjoy the stunning scenery and take it all in! It was amazing how well marked everything along the Ring Road (Route 1) was! However, this waterfall was the one place that we had to “search” a little for (and by search, I mean drove past it once and found it right away on the way back!) 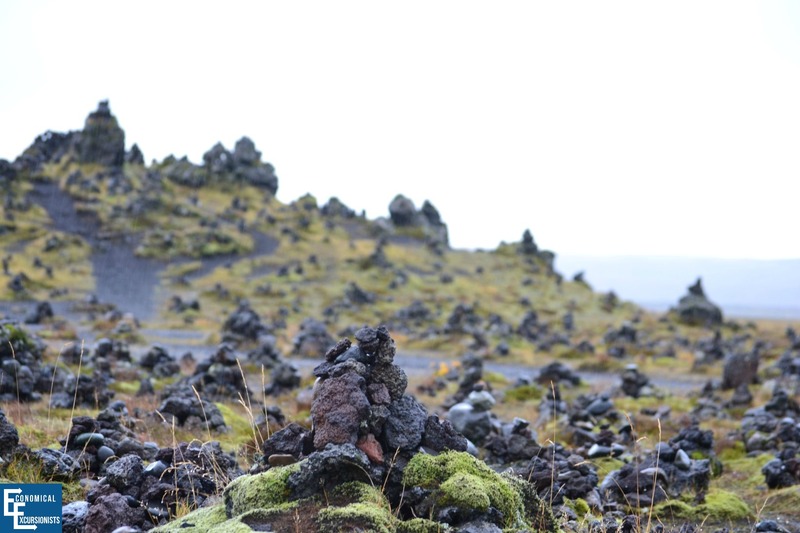 The GPS wasn’t pulling up the name “Fossardálur” correctly, so we relied on the GPS coordinates (below). 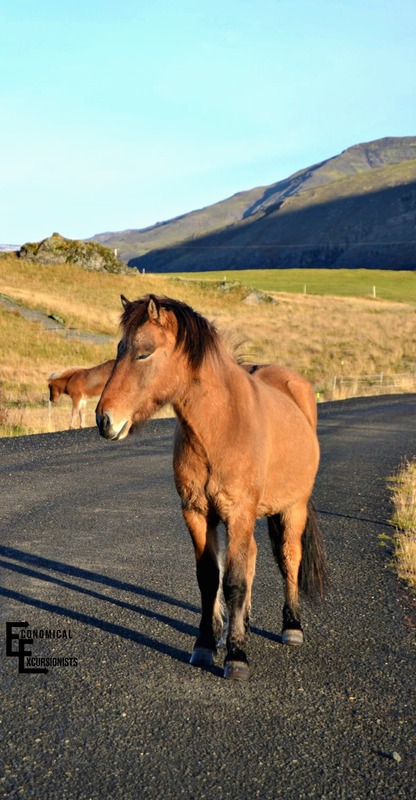 Off the ring road, we turned left onto Eyjólfsstaðavegur street and followed the winding road up. There is an “attraction” symbol next to what looks to just simply be a barrel, but this is exactly where you need to go. Watch for the “attraction” sign! There is a small pull-off directly across the street. Walk through the barrel and make your way through the shrubbery and questionable walking path until you are standing directly on top of the beautiful, raging waterfall! Shortly after the waterfall, you will have two options for roads. In winter, the mountain pass is closed, but if it is safe driving conditions, it was one of the most stunning stretches of driving we had! You are smack dab in the middle of the pass, with the most amazing tiered cliff sides looming up on either side. In fact, it was so beautiful, that when I normally have the camera stuck up to my face, I realized afterwards that I was just taking it all in! (Ok, that and the drive was actually kind of nerve wracking, and I was too nervous to not be focused on the road ahead!!) The roads are narrow, often riddled with pot-holes and much of it is a dirt road. I am so glad that Andy is a confident and skilled driver and didn’t care that cars were filing up behind us. We just took our time, both playing it safe as well as enjoying our views!!! After the mountain pass, you will be entering into a pretty barren land. Say goodbye to gorgeous mountain scenery and hello to flat plains. This is, however, the stretch where, if you are lucky, you may just spot some reindeer! Sadly, for us, with it being only two months from Christmas, I can only assume that they had all met up with Santa and were training for the big day instead of roaming in the wild. To read more about driving in Iceland, the roads, etc read the Tips for Travel: Iceland. Depending on your time in Iceland, if I had to choose a shorter version of the trip, it would be this South stretch of the Ring Road and island. 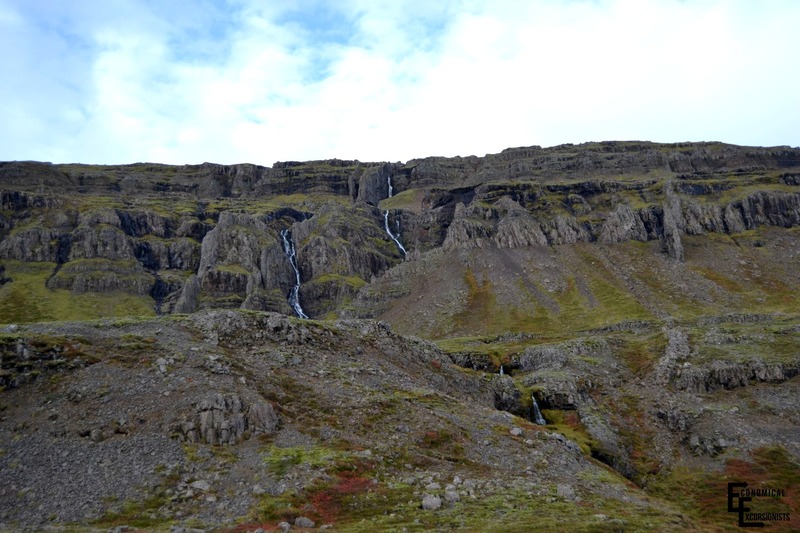 At this point in the itinerary, before the mountain pass, you could either book it back to Reykjavik or continue through the Pass and up towards the North. While the North stretch of the Ring Road still has absolutely stunning sites, our favorite destinations and scenery were actually in the South. 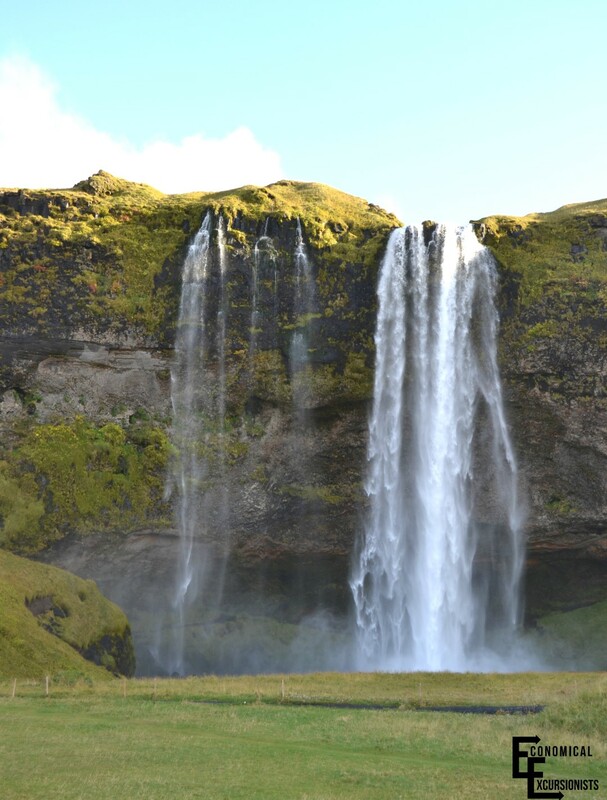 However, if you have a full week to explore, continue reading on in the Iceland Itinerary: Part II to read more about the most powerful waterfall in Europe, walking on a geothermal volcanic field and soaking in the Myvtan Blue Lagoon. Admittedly, I only looked at the pictures (no plans to visit Iceland anytime soon), but the photos are incredible! It looks like you guys had anunbelievable adventure! Holy cow! I mean i’ve been wanting to go to Iceland forever but this really pushes me towards it. Did you really get all that in one week? Incredible, thanks for sharing! If you have the opportunity, GO! We did the Ring Road all in a week (honestly, we had plenty of time and still had time to enjoy each and every site we wanted to) plus an additional day and a half in Reykjavik. Be sure to check out the other posts on Part II, campvervanning it up and more! It was definitely a trip to remember! So I am planning a trip to Iceland. We land at 4 am on a Saturday and have to be back at the airport around noon on Thursday. I loved your idea of doing the ring road in a week, but we don’t have a week. Anyway, I am wondering if you have any suggestions on what to leave out, or some more time-cutting ideas. Also, it will be December, so a winter trip and less daylight… Any thoughts? Also we were thinking more of Airbnb for cost cutting…? You’ll love it! Unfortunately, since we were there with plenty of sunlight, I’m not 100% sure how to direct you appropriately for Dec (aka almost NO sunlight). Of course you don’t want to be spending hours driving just to see nothing in the dark. You’ll have to look into that. We really loved the South (Down along the Black beaches). Not sure how much time you have, but I’d say the Golden Circle and down along the coast could be a great glimpse into the Island. Sadly, we found that even AirB&B wasn’t cheap! Maybe you’ll have better luck. In low season, it may not be a bad idea to contact the hosts directly asking for a winter discount? We went to Iceland with our own car. There is a ferry from Denmark. It takes three days, but it is a blast and you get to go to the Faroe Islands as well. I agree, Iceland should be on your list! Iceland is so so much in my wiish list and bucket list. May God show me the way to visit this incredible place. I, too, hope you can experience the beauty of Iceland! Don’t forget to “Pin” anything so that you can come back when it starts to become a reality! That looks like quite a packed itinerary! I’d love to do all of these things, but at a slightly slower pace! 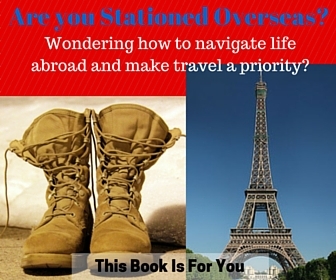 Thanks for sharing, bookmarking it for when I plan that trip for next year! I was so overwhelmed with trying to figure out how much time to spend at each location (hence why the campervan option was so perfect) but we honestly weren’t rushed in the slightest. In fact, there were many times where we actually took a nap in the car during the day, had a long lunch, waited for the rain to pass, etc. It was so great to be able to go at our pace! If planning a trip, don’t forget to check out the other pages (Campervan, Things to Know Before Going, Resource Guide, etc) that are all posted as well! Iceland seems to be such a popular place to travel at the moment and I can see why, so much diversity, natural wonders and stunning landscapes. Tourism has absolutely BOOMED in Iceland in the last few years alone. This is even more of a reason to get there now (before everyone else does and it gets TOO touristy!) But it is also an important reminder that despite how many people go, we need to continue to care for the beautiful nature there so that future travelers can enjoy it just as much! The Flybus does not have a monopoly on trips between the airport and Reykjavik. There are two lines that serve the route – Flybus and Airport Express. Plus, the capital area municipal bus service (Strætó) also goes to the airport. Strætó is a lot cheaper but trips are only during normal operating times (~6am – 12:30am) and it includes several stops along the way and so takes longer than the others. If you’re planning to visit museums you should look up the Reykjavik City Card. A one-day pass is about $40, 2-day about $50. It includes free buses, free entry to museums, swimming pools and more. Great tips! You are right, there are municipal buses, but they are at pretty horrible times and, like you said, on an already long ride out to Keflavik, it was going to become a half day affair just to get there! Awesome tip on the museums. We aren’t huge museum goers to begin with and, as budget travelers, $40 is just about over our daily budget! But, when it includes buses, entry and others, it could definitely be worth it for those who are interested! Thanks! Wow, your pictures are stunning! Especially the ones at Jökulsárlón Lake. I had no idea there was so much free camping in Iceland! Didn’t realize tourism was growing at such a rapid rate either. I hope travelers will respect the nature and beauty of this incredible country. You’re making me realize we need to go there sooner than later! I do like reading your comments. 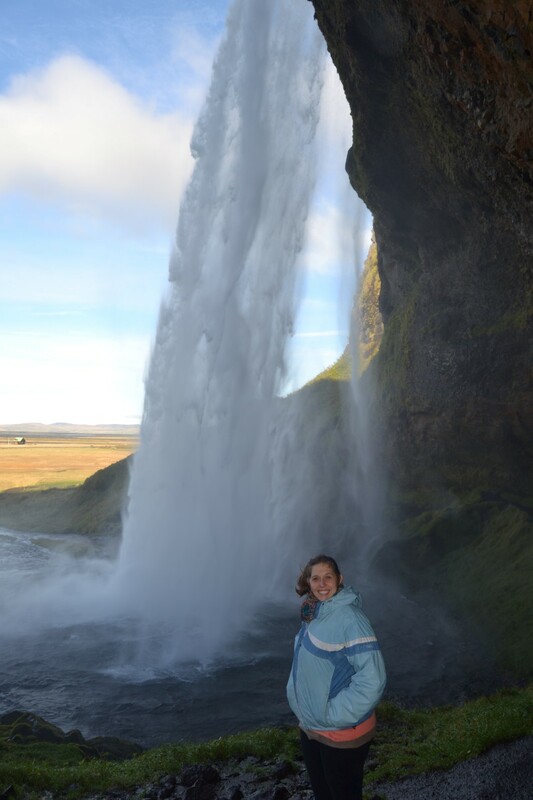 However, just one little thing Fossardálur Waterfall I believe is actually Sveinstekksfoss. 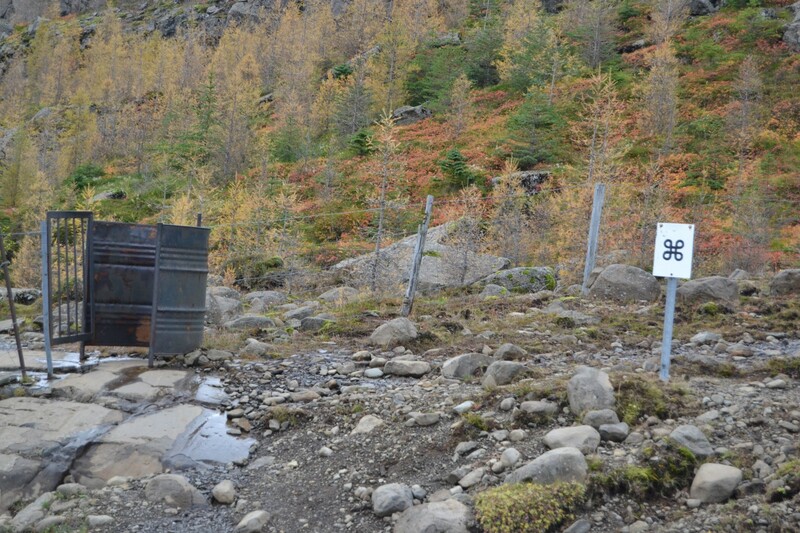 It is about 45′ fall in a very deep canyon which can also be seen from the steel bridge at the bottom on road 939 off of Ring Road 1. Hey LeAnna! Thanks for the fantastic information! My husband and I are heading on a (very) last minute trip to Iceland in two weeks and I will be 5.5 months pregnant. I am wondering which model of campervan you guys rented and how the bed was? This is by far our largest concern as some are shown as only being 105cm wide, but we’re trying extremely hard to make this trip work via campervan as we adore a “do our own damn thing” style of travelling. Any tips for a travelling preggo would be greatly appreciated! Hey Kris! 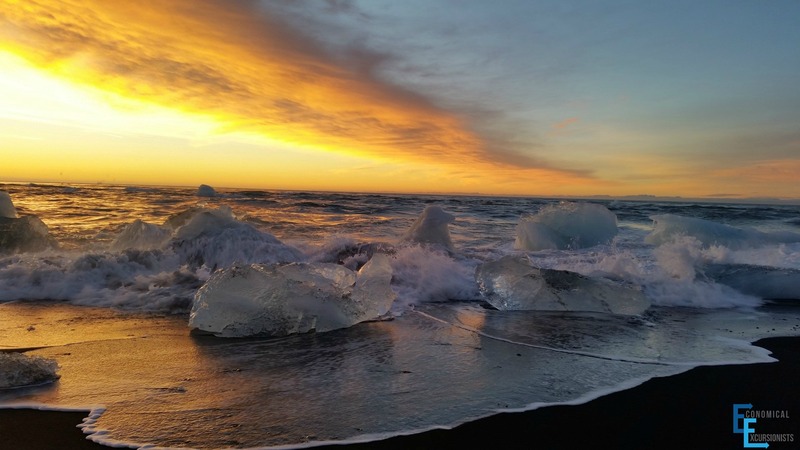 You are going to LOVE Iceland! Just as a reminder, I believe some laws have changed and you can’t just “free camp” anywhere anymore, but that shouldn’t stop you from the camper van option, as it is still an amazing experience! I don’t know the exact model of the camper van we used, but as per their site, it was a 2-pax. Basically it was a utility van converted for accommodations. There is no real “living” space inside other than to lay down (and sit up) on the mattress. It’s not like an RV where you can move around and do stuff. The mattress was probably about a double, which was personally more than enough space for us. Good luck!